Tesfahun Alemayehu, research associate and economist with the African Chicken Genetic Gains (ACGG) program in Ethiopia, gives an account of the recent on-farm training sessions that took place in the three countries (Ethiopia, Nigeria and Tanzania) where ACGG operates. An on-farm chicken performance study is evaluating and determining the high producing chicken strains that are preferred by smallholder farmers in Ethiopia, Nigeria and Tanzania. The study is being carried out by the ACGG program which is seeking to increase smallholder chicken productivity in Africa. In each of the three countries, five to six tropically adapted chicken strains will be tested in the on-farm study. In Tanzania the chicken strains tested will include Kuroiler, Koekoek, Embrapa 051, Sasso, and Black Australorp. In Nigeria, the strains to be tested are Kuroiler, Koekoek, Embrapa 051, Shika Brown, FUNAB Alpha and Fulani. The Kuroiler, Koekoek, Embrapa 051, Sasso, Fayoumi, and Horro strains will be tested in Ethiopia. Selection of all on-farm villages or on-farm study villages across the three countries. The on-farm study will be implemented in 57, 60 and 83 villages of Ethiopia, Nigeria and Tanzania respectively to reach a total of 200 villages across the project countries. 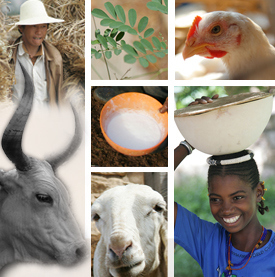 Selection of villages for the on-farm study in each country is almost complete. commitment to provide supplemental feeding; and willingness to participate for a minimum of 72 weeks in ACGG data collection (pending adverse events outlined in a consent form). Based on these criteria, in Tanzania, 3320 households have been selected for the on-farm tests. The selection of 2400 households in Nigeria and 2280 households in Ethiopia is ongoing. In total the program will have 8000 on-farm households. Production of an ACGG on-farm training manual. This manual will be used by enumerators, supervisors, sub-national coordinators, national project coordinators (NPCs), principle investigators (PI) and co-PIs. An informed consent form which includes information about what is involved in the study; exit from the experiment; risks and benefits of participation; confidentiality; incentive mechanisms; rights and responsibilities of participating households and contact details of the ACGG country team members is available. The information in the form will be shared with each household and delivery of strains will only be done if the participants understand and sign the form indicating they voluntarily agree to participate. Training of country project teams. Training of enumerators, supervisors, sub-national coordinators, NPCs, PI and co-PIs is ongoing. The training covers the experimental design of the on-farm stud, data to be collected and data collection schedule, recommended feeding and health management standards and how to use Open Data Kit (ODK) system to collect data including practical exercises in using the ODK in the field. The Tanzania team training took place 4-8 April 2016 and was attended by 90 participants including 83 on-farm data collectors. In Nigeria, the same training was given as training of Trainers (TOT) from April 24 -28th 2016. Fifteen supervisors (3 per each sub-national zone), 5 sub-national coordinators, one co-PI, one technical assistant, one administrative assistant and the project management officer participated. In Ethiopia, the same training was given from 23-27 May 2016. Tags: on-farm study, Tesfahun Alemayehu. Bookmark the permalink. I have MSc degree in Applied Genetics and i have a great desire to participate in this programme!